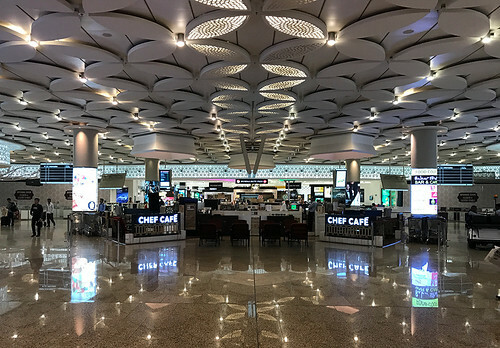 I was heading back to Kuala Lumpur after a short visit to my hometown, Mumbai for the Chinese New Year holiday. 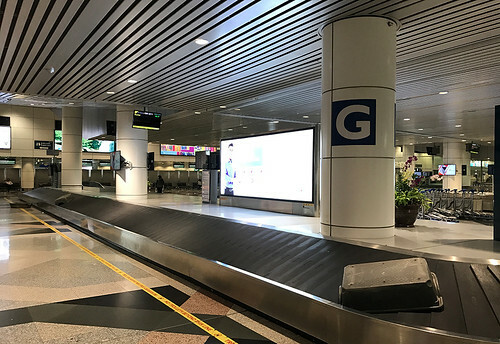 At the time, there were only two airline options between BOM & KUL – Malaysia Airlines (which operated two flights daily) and Malindo Air (one flight daily) Both airlines operate the narrow-body Boeing 737 on this route. Since then, Indonesia AirAsia X has started a flight to BOM, deploying an Airbus A330-300 on the DPS-KUL-BOM route. Anyway, I had booked my travel to BOM and back on MH. 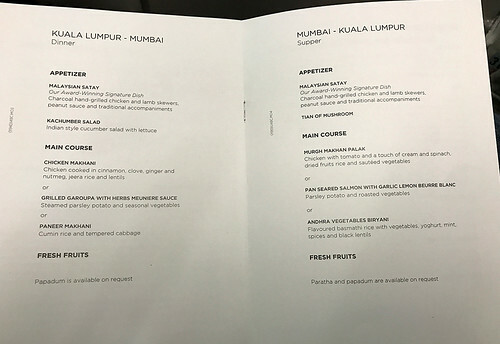 This report describes my journey back to KUL on Malaysia Airlines Business Class on their Boeing 737-800. 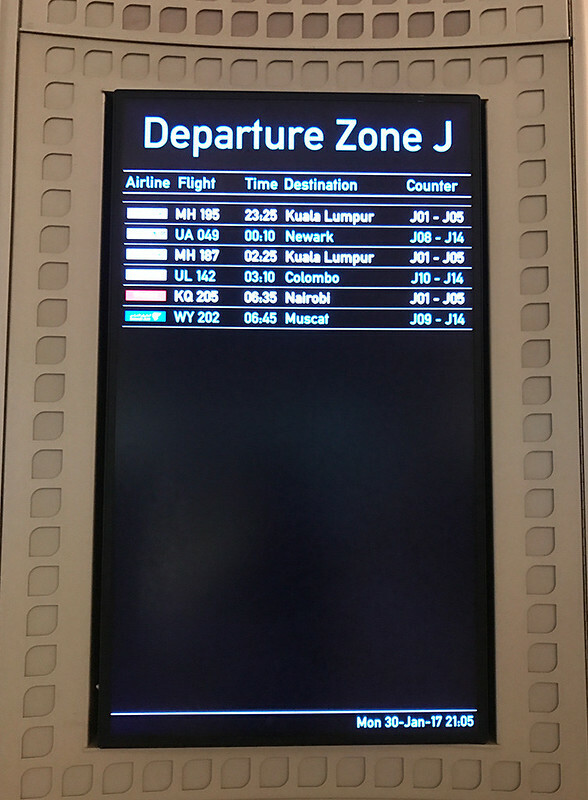 I was booked on MH 195, the traditional late night departure out of BOM for Malaysia Airlines. 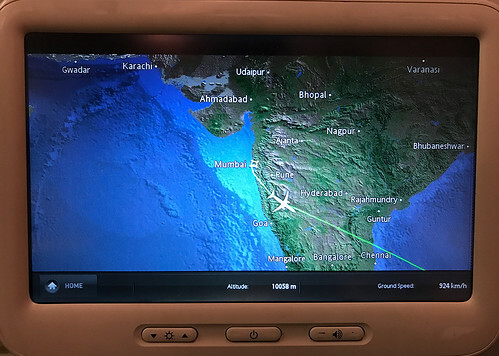 This flight used to be operated by MH’s B777-200ERs before the type was phased out in late 2015/early 2016. To overcome this downgrade in capacity, MH has added a second daily flight, which departs BOM at 0225 in the morning. 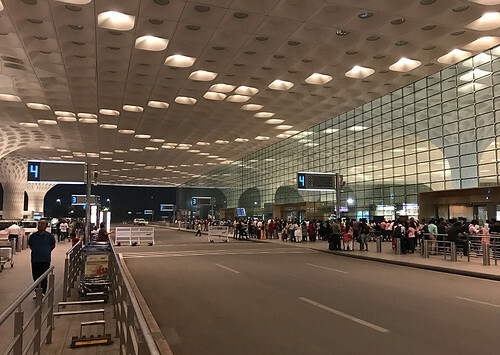 The late evening traffic on the way to the airport was not too bad, and I arrived at the CSIA Terminal 2 drop-off area nearly 3 hours before departure. 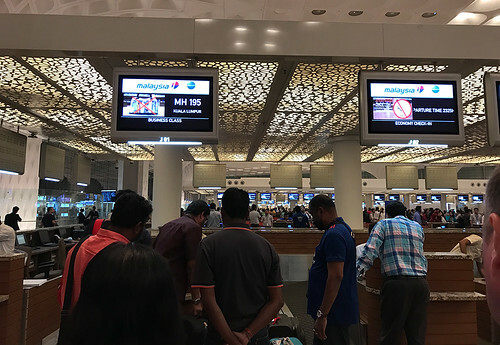 The Malaysia Airlines check-in counters are located in Row J, and there was a sizeable queue there. The Business Class counter had 4-5 people ahead of me, and it took nearly 7-8 minutes for my turn. 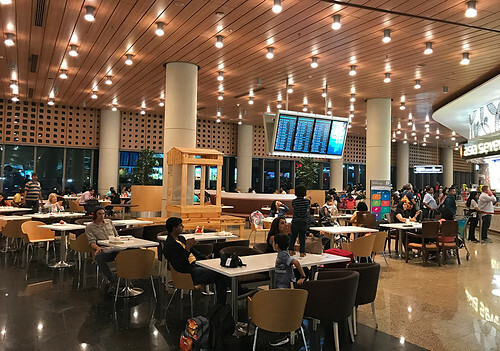 The check-in process was fast, and took less than five minutes, and I was handed my boarding pass, lounge invitation and the immigration departure card. 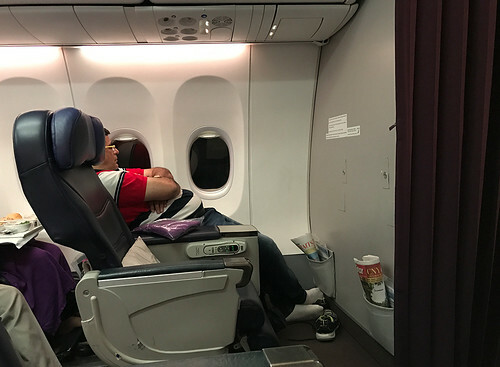 I was on seat 1F – a bulkhead window seat. 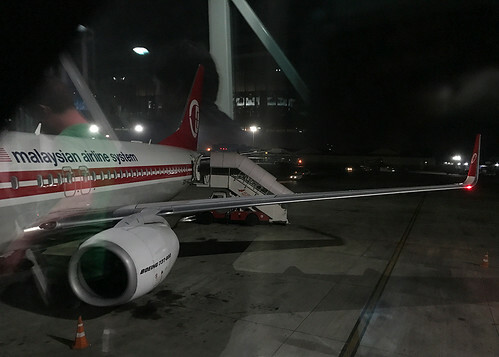 The aircraft flying me back to KUL was 9M-MXA, wearing the “40 Years of MH” retro colours. Woohoo! 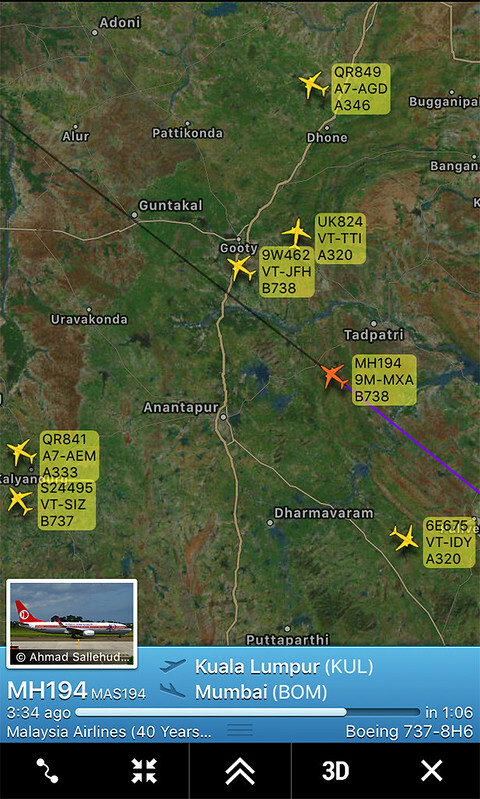 A quick check on FR24 revealed that the incoming aircraft was over an hour away. Security check was next, and took no more than five minutes. 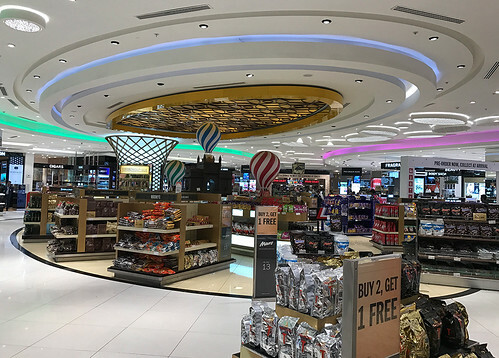 There was a long queue for immigration however, and the process took nearly 15 minutes, before I was released into the Duty Free area. It was now time to head to the lounge to relax for a bit. 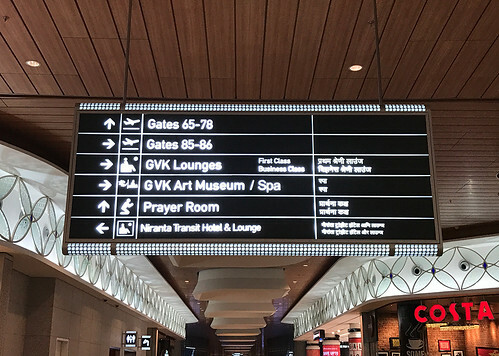 BOM Terminal 2 has a common use lounge called “GVK Lounge” for premium passengers. 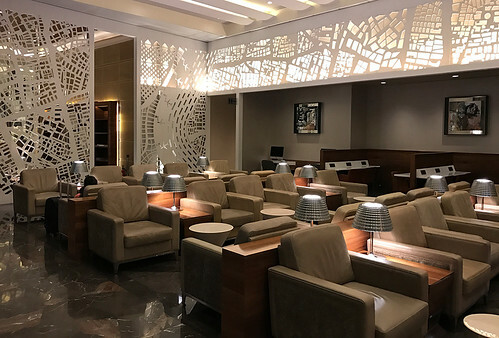 The lounge is massive, and is divided into two levels – one for First Class and the other for Business Class passengers. 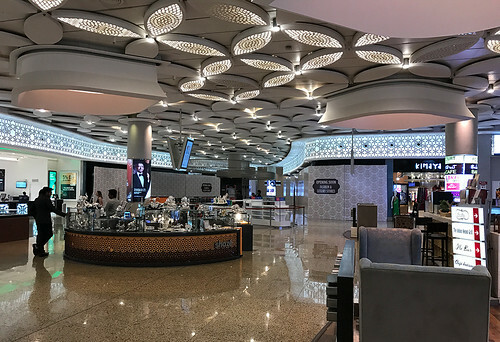 At the outset, I was not sure whether having a common lounge was a good idea for an airport the size of BOM. 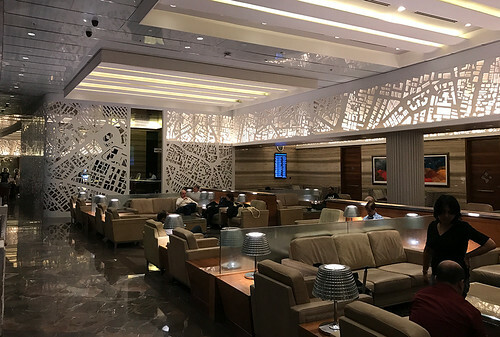 It was possible that the lounge would get overcrowded, especially during the peak international departure times. However, after using this lounge on a few occasions, I have never seen it being crowded. 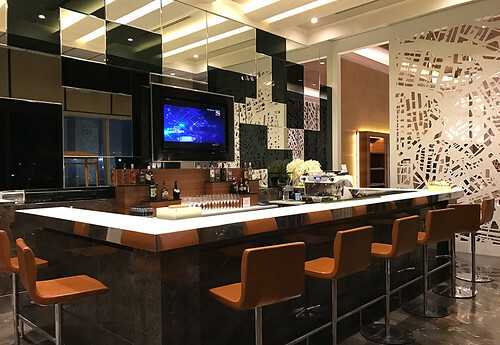 Here are a few photos of the lounge. The ornate entrance! 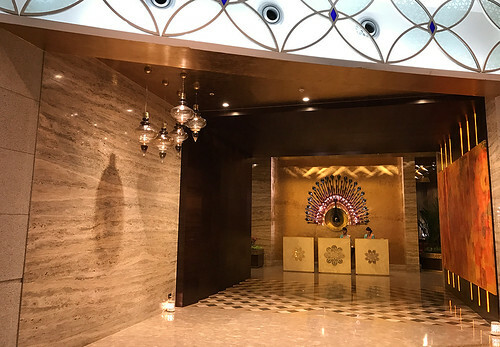 Looks more like the entrance to a fancy hotel! I was feeling quite hungry, as it was way past dinnertime. 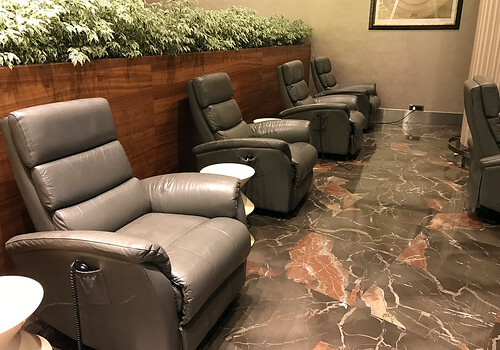 The GVK lounge offers its patrons a complimentary 15-minute neck & back massage or a 15-minute foot massage. I opted for a foot massage and after finishing my dinner, headed to the in-house spa. It was pretty relaxing, and I was charged up for the upcoming flight. As the boarding time approached, I headed out towards the departure gates. We were to depart from Gate 69 that night. 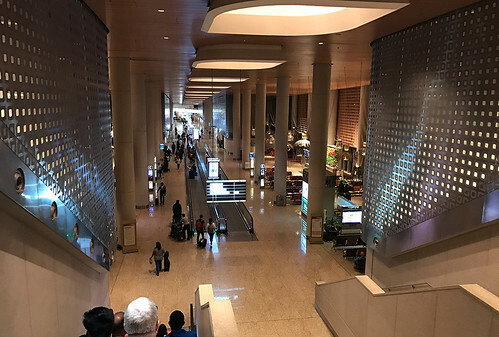 A view of the walkway to the departures area. 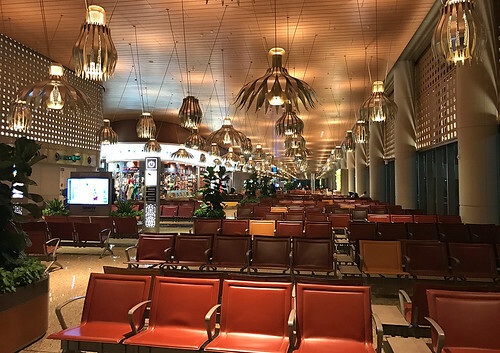 The seating area at Gate 69. Look at those chandeliers! As I sat down at the departure gate, our aircraft had just landed and was taxiing towards the terminal. Here she is, about to dock at the gate. We had to wait for another 30 odd minutes before boarding was announced. 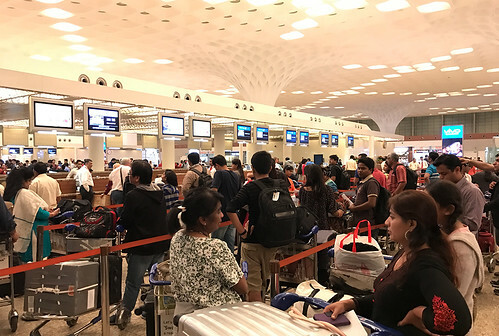 As is the ritual, families with infants and children were invited to board first, followed by Oneworld premium members. 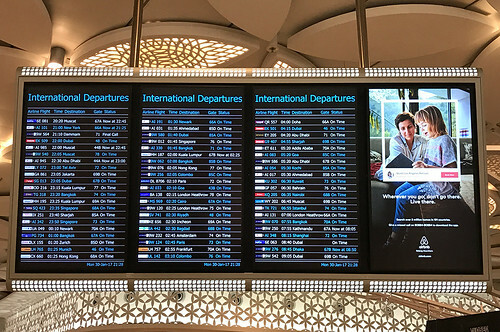 Business Class passengers were asked to board at their convenience. A view of our aircraft from the aerobridge. I was greeted by a couple of MH cabin crew at the aircraft door and ushered to my seat. 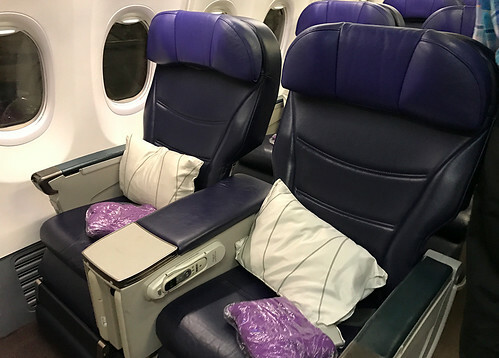 The Business Class seats on board Malaysia Airlines 737-800. Pretty standard stuff. A welcome drink was offered. There was a choice of apple juice, orange juice or water. I opted for the orange juice. 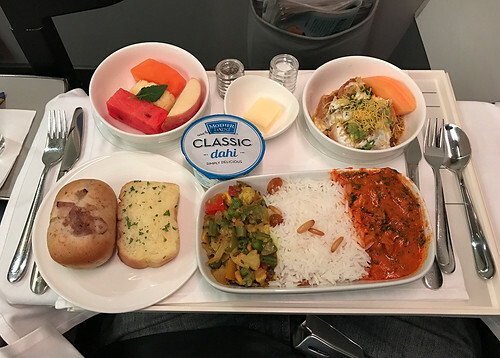 Three main course options on this five-hour flight is not bad at all! 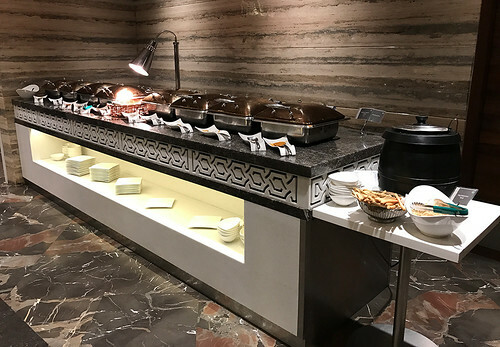 The highlight is the appetizer consisting of Malaysian satay. Yummy! The beverage selection on the menu. 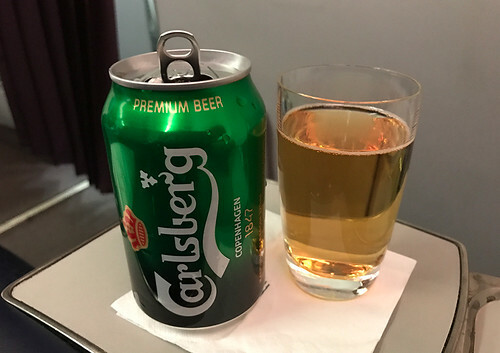 There were no alcoholic beverages listed on the menu although MH does serve them on the flight. Boarding was soon complete, and doors were closed. After a wait of another 10 minutes we got our pushback clearance, and we began our taxi towards Runway 27. 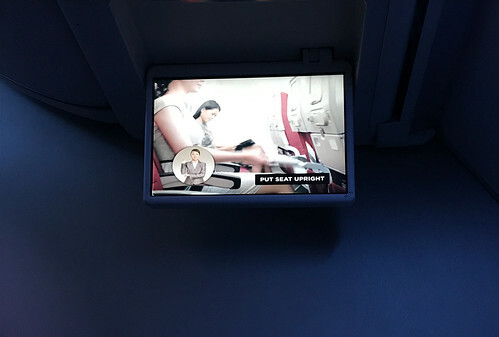 The cabin lights were dimmed for take-off and the safety video was played on the IFE screens. Since the IFE screen for the bulkhead seats is in the armrest, a nice little drop-down screen did the job instead. 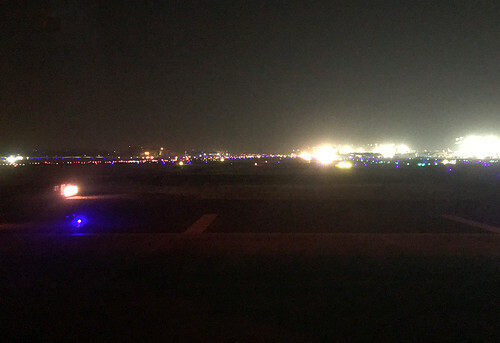 After waiting for a couple of arrivals, we lined up on the runway and were airborne after a longish take-off roll. There were no clouds in the vicinity, and the seat belt signs were soon turned off. My seat at the full-reclined position. 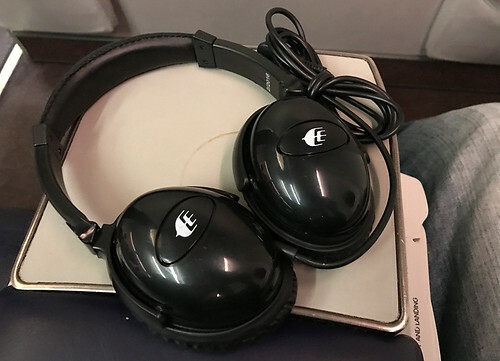 The cabin crew then handed out a pair of headphones. These active noise cancellation headphones were a bit on the heavier side but did a decent job of blocking out the noise of the engines and the surroundings. The sound quality of course was average. 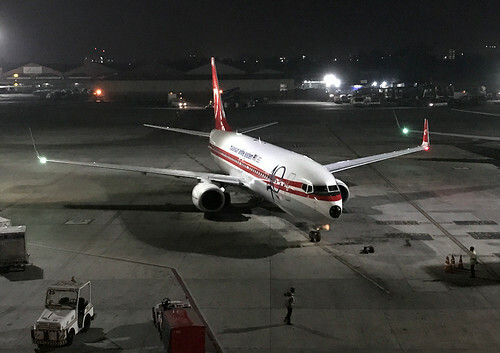 Although this aircraft wears the retro MH livery on the outside, it is anything but retro on the inside. 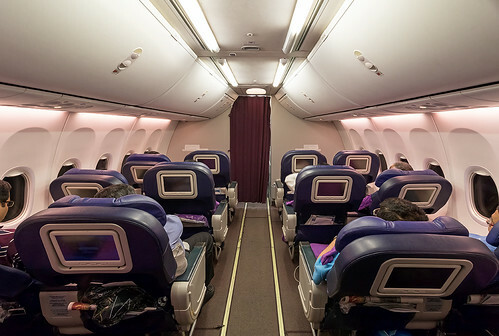 The cabin is equipped with the Boeing Sky Interior and looks quite up to date. Here is a view of the Business Class cabin on our aircraft featuring a total of 16 seats. The drinks trolley made an appearance soon and I asked for a beer. 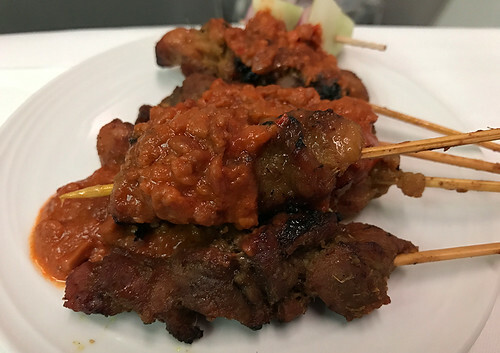 An appetizer consisting of some delicious Malaysian satay with a lovely peanut dip was served. 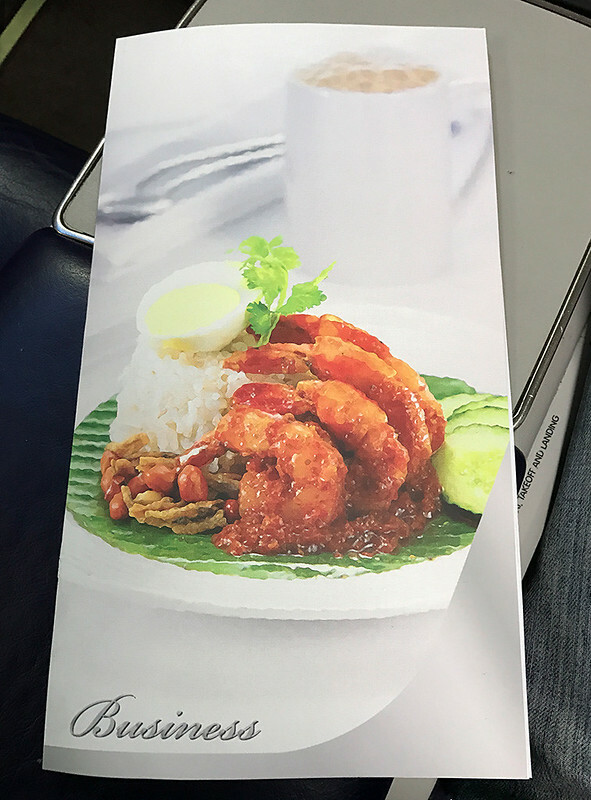 The satay is a trademark MH offering, and I am glad that the airline continues to serve it. The piping hot satay was a perfect accompaniment to the chilled Carlsberg. Just the right environment to pull out the IFE screen and do a bit of TV watching. 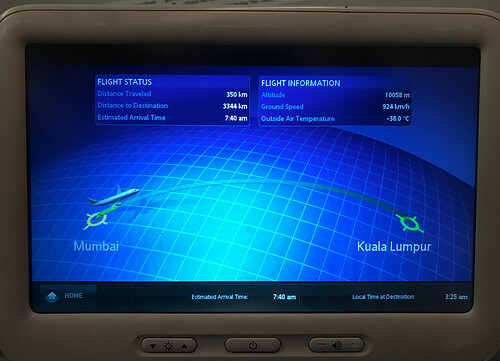 We were flying on a roughly south-easterly heading on our way to KUL. Over 4 hours to go. Another view of the front row. Two seats vacant tonight. I had finished my beer and the lovely satay, and the crew asked me if I was ready for the main meal. A tablecloth was laid out and the crew brought out the meal in a nice little tray. “Supper” consisting of a chicken gravy along with dried fruits rice and sautéed vegetables. 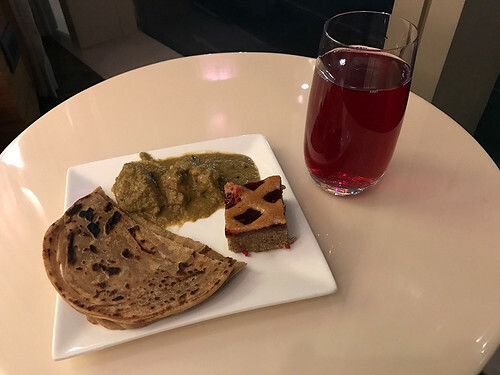 This was accompanied by a bowl of yoghurt; cut fruits, an assortment of bread along with some “dahi-samosa chaat”. 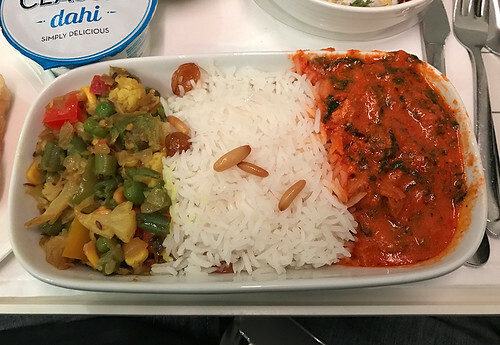 The portion served was sufficient for this flight. The taste was good, nothing really spectacular. 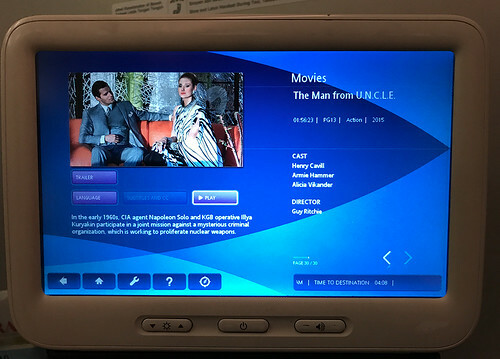 After having my fill, I decided to watch a movie as I find it difficult to sleep on a flight. 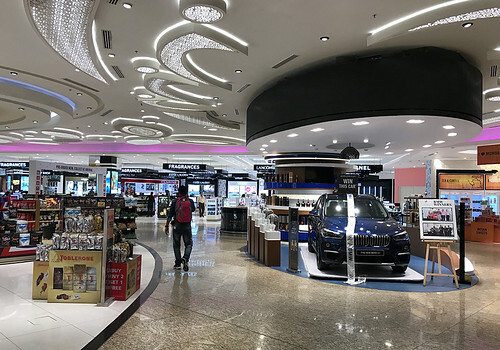 Malaysia Airlines doesn’t hand out full-fledged amenity kits in Business Class on their regional routes operated by the Boeing 737s. Instead, the crew distributed eyeshades and slippers. This is one big improvement area for MH, as SQ hands out mini-kits even in Premium Economy Class on their BOM-SIN flights. I finished watching the movie, and tried to fall asleep. I was successful, and only woke up as we were passing over the Malacca Straits. I freshened up and was listening to some music when our first officer announced that we would soon start our descent into KUL. 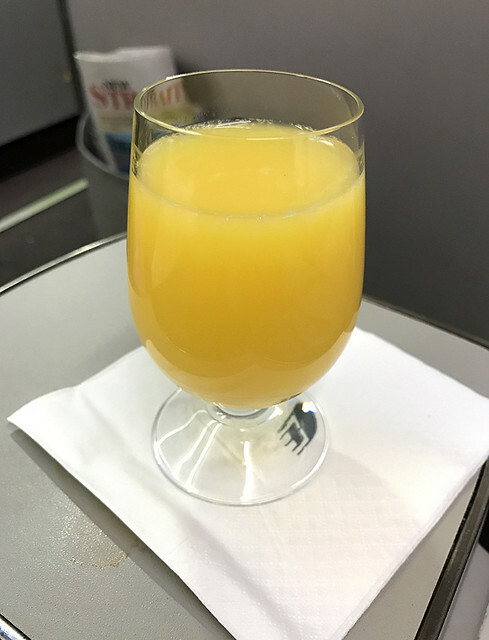 The cabin crew appeared with a tray of drinks as people began to wake up. I downed another glass of orange juice. The cabin crew did their ritual of preparing the cabin for arrival as we began our descent. The descent was relatively smooth with only one layer of clouds to plough through. 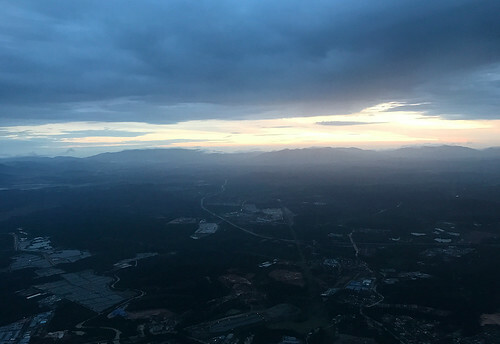 The sun was just rising over the district of Sepang as we made a 180-degree turn to line up on our final approach to KUL Runway 32L. We touched down with a nice, positive thud and a brief application of the twin reversers slowed us down to taxi speed. 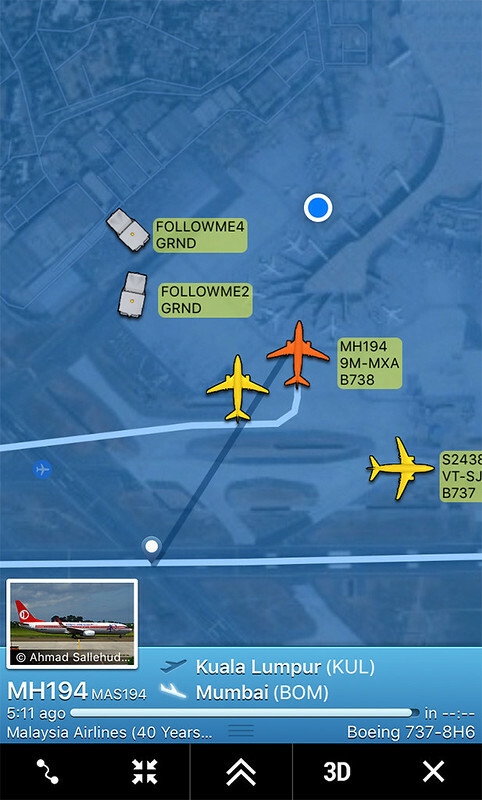 We taxied towards the KLIA Satellite Terminal and finally docked at our gate some 20 minutes behind schedule. Not too shabby at all! It took another 5-7 minutes for the door to be opened, and I thanked the crew and walked out of the aircraft. 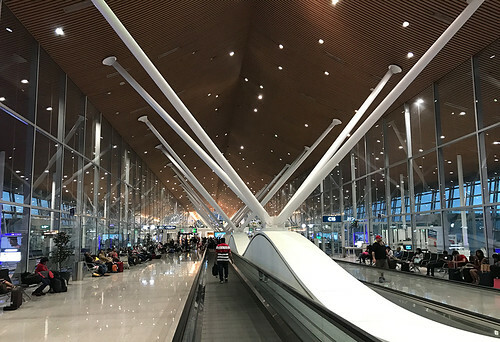 A view of the KUL Satellite Terminal. Love that design! 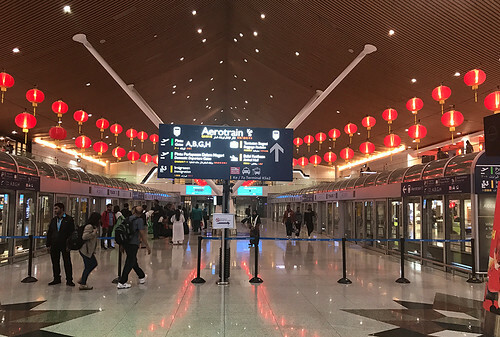 The terminal was nicely lit up for the Chinese New Year holiday. 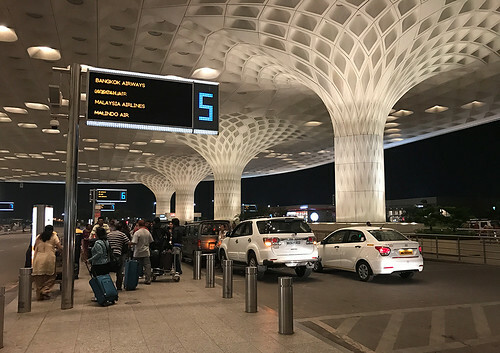 After a quick Aerotrain ride to the main terminal, I made my way towards Immigration. 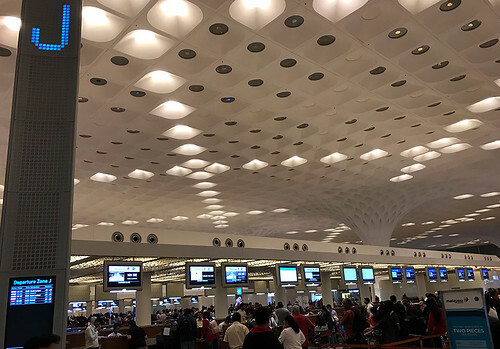 There was no queue at all at the dedicated First/Business Immigration counters, and my passport was stamped within a minute. 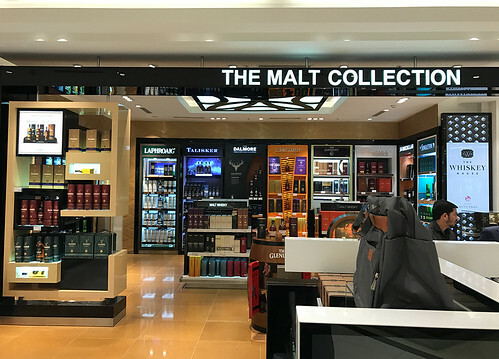 A brisk walk later, I was at our designated baggage belt to be greeted by this sight! It took nearly 10 more minutes for the bags to start arriving, and thankfully mine was amongst the first lot to arrive. 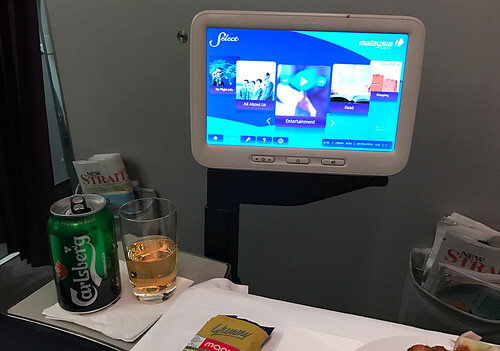 It was a typical narrow-body regional flight experience on board Malaysia Airlines Business Class. 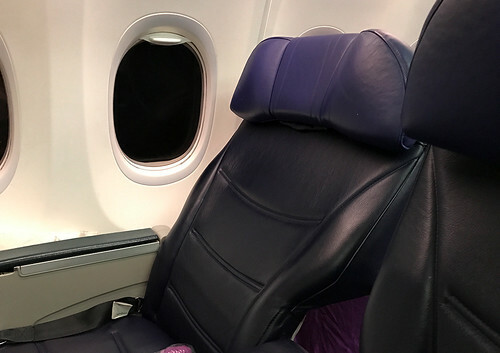 The seats are your average 737 style recliner seats. The extra width as compared to Economy Class is welcome though. 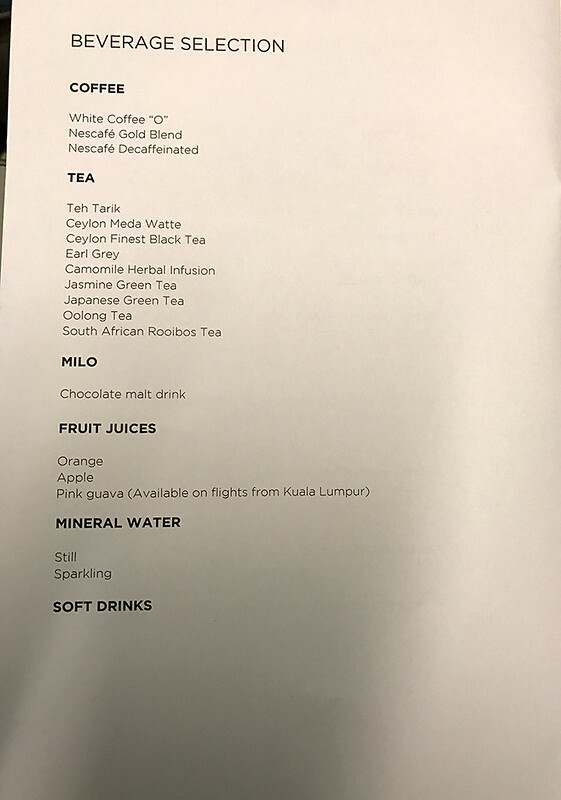 The onboard service on Malaysia Airlines leaves a lot to be desired. 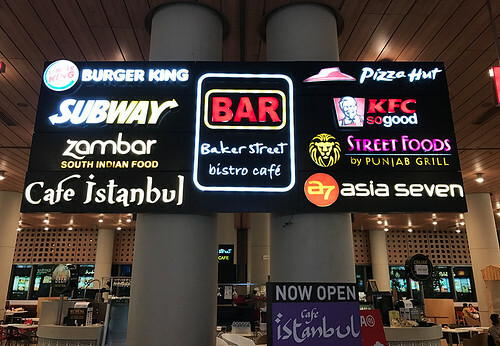 The lack of a comprehensive menu listing all the beverage options is one callout. The service from the cabin crew is average with no personalisation at all. A bit of a letdown here. 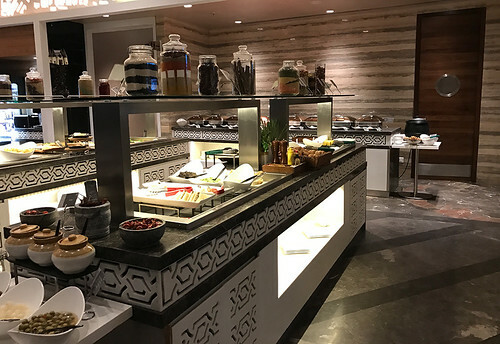 The food options are good, and the serving portions are sufficient. The signature MH satay is a big plus! 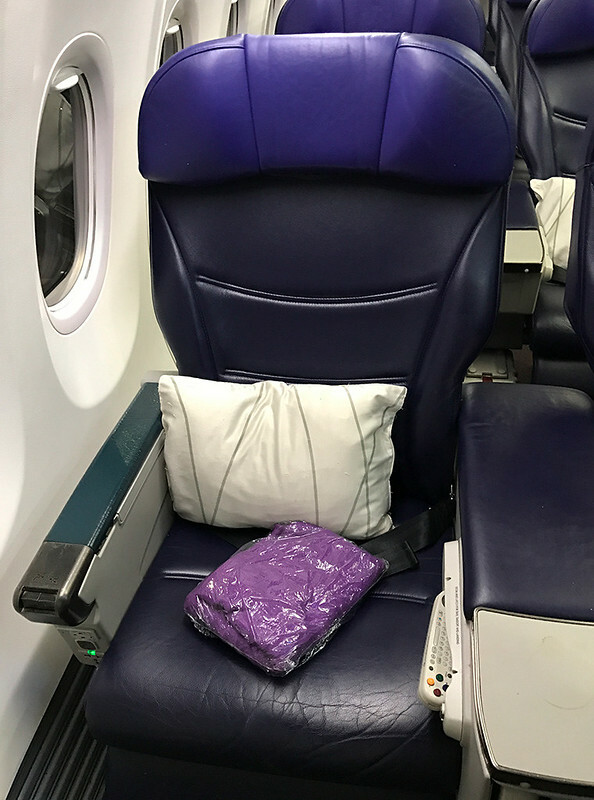 The lack of amenity kits in Business Class is another big letdown. 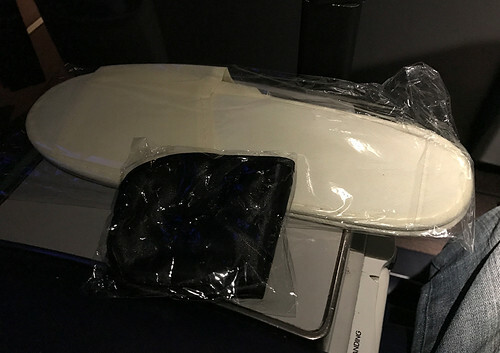 Other airlines offer mini amenity kits even in Economy/Premium Economy Class on overnight flights. 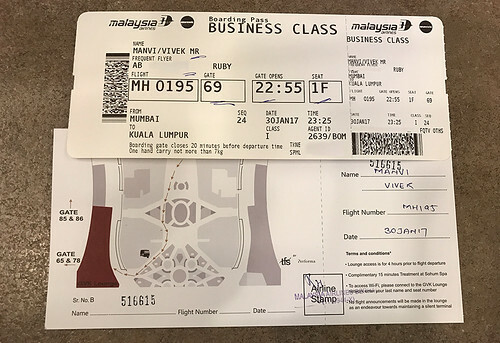 Even Malindo Air – which is a semi-LCC and is a direct competitor to MH offers an amenity kit in Business Class! Hope MH looks into this aspect soon. 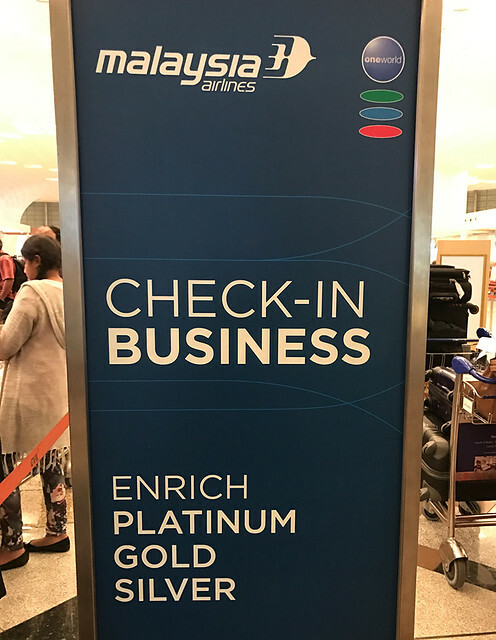 Hope you enjoyed this report on the Business Class experience onboard Malaysia Airlines Boeing 737-800. 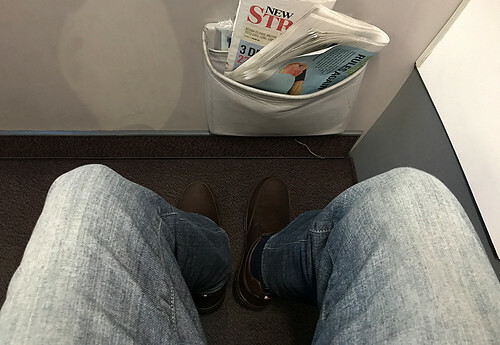 This entry was posted in Trip Report and tagged B737-800, BOM, Business Class, KUL, Malaysia Airlines. Bookmark the permalink.